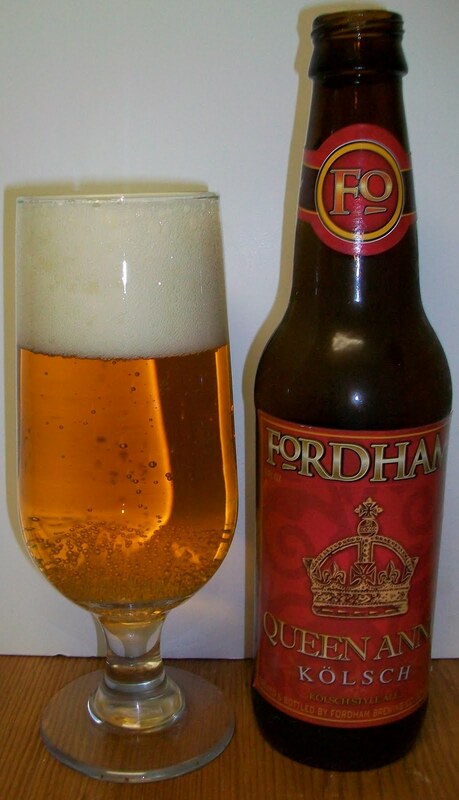 Just in time for Spring, Fordham brings you a delicate and refreshing top-fermenting Kölsch ale that is sure to please the palate. With a straw golden hue, medium hop bitterness and a dry finish, our craft interpretation of this German style ale would have been hailed by Queen Anne herself. 5.0% Alcohol by volume. Brewed with select European & American malts & hops. Bier Cabinet Spring Cleaning Continues. Well, this is another one that was hiding in the fridge. I bought this on a whim about a month ago and really liked it. I really like this style of beer it has an almost nostalgic taste to it, similar to the nostalgic taste of a classic Pilsner. It’s like the American heritage of our German Beer Roots. I do have to apologies upfront for not having the appropriate glass. This style of beer is usually drunk in tall cylindrical glass called a "stangen" (rods). This is one glass that I have to add to my collection. The closest thing I have is this smaller cervoise, more like an oversized flute. The beer pours a pale golden straw with a bright white head, and highly carbonated. Very nice “kolsch” nose on this brew. It is slightly different and very unique to this style of beer. There is an earthy German aroma to it, almost skunky but also being very pleasant. There is also a slight hop presence and some sweetness but it is all behind that earthy “Kolschness”, whatever that is. This is nice, very nice. Very light sweet pilsner type malts upfront then a very clean and refreshing effervescence over your tongue in mid-sip. Those earthy flavors start to make themselves known just before you get to the swallow. This is a fairly easy breaking beer through the swallow. The finish is light with a crisp or sharp hop bite but I would not consider it bitter. It’s more like an old fashion pilsner bite or crispness. There is slight aftertaste; it’s more of that earthy almost skunky bite. Sorry I’m not doing this justice. This is a very nice and refreshing beer. I’m just having a hard time explaining that classic Kolsch flavor. It is a unique somewhat earthy somewhat skunky taste. But all and all this is a very clean and refreshing beer. Let’s try this. Take a good clean pilsner like Pilsner Urquell and add an earthy background to it. I am really enjoying this beer. It is a bright sunny spring day; late afternoon on a Sunday in mid-April. We have about an hour before Sunday dinner and this beer is just hitting the spot. The beer is clean and refreshing, not necessarily light but not heavy enough to spoil dinner. (Yeah, like a beer can spoil dinner.) This is just a perfect mid-day beer. I’m drinking this one kind of fast since it is so refreshing. I’m down toward the bottom of the glass and the beer has warmed to 60 degrees. It is warming well, there is absolutely nothing unpleasant about this beer. It can probably go another 10 degrees or so but we won’t know since I’m killing it now. This was a very nice rendition of the Cologne Germany classic Kolsch. I’m really not sure what to do for a grade. This is the first Kolsch that I have given a full review on. I’m going to go for a B for now. That may change once I review a few of the authentic German Kolsch’s. I do recommend this beer. Anyone that likes a classic pilsner will like this also. It does have some earthier notes to it but it remains a clean, crisp and refreshing beer. A Kolsch is a mixed style so it is widely appealing to both Ale and Lager lovers. Nice Kolsch, very clean and refreshing beer. This is my gold standard or the Kolsch style. My first choice would be Muehlen Koelsch. The brewery is small and the beer is hard to get even in Koeln, but wow!!! Gaffel and Reissdorf are in my top 5, too. Thanks for commenting on this post. I checked out the website and it doesn't look like the export to the USA. If I ever make it to Köln Germany I'll try to look them up.